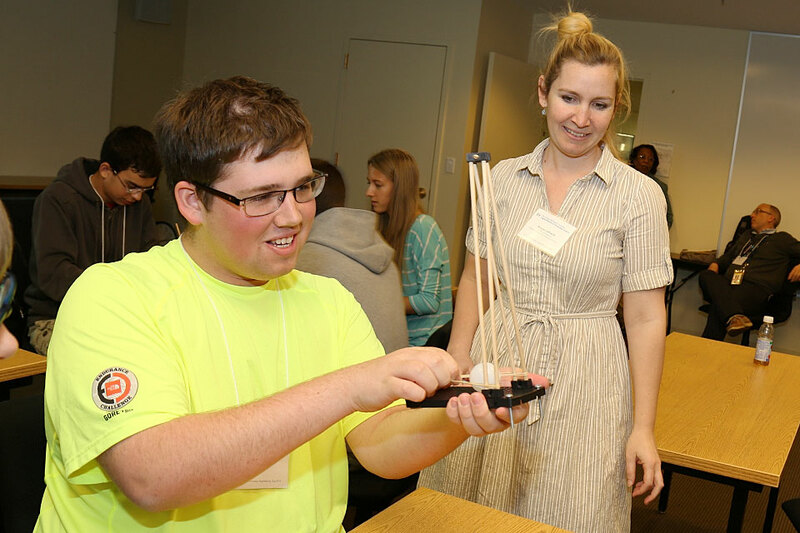 The Virginia Science and Technology Campus hosts 130 high school students for ninth annual event. Sasha Chowdhury, a Stone Bridge High School junior, would love to intern with Google once she is a college freshman. “They’re not hiring high schoolers,” she said during a visit to the George Washington University’s Virginia Science and Technology Campus (VSTC). It may be a few years before Ms. Chowdhury helps to perfect Google’s driverless car, but on Tuesday, the budding scientist had the opportunity to check out a “pretty cool” instrumented vehicle developed by Professor Samer Hamdar and a group of GW researchers in the university’s Traffic and Networks Research Laboratory. The 2001 Ford Taurus—specially outfitted with a laptop and pricey equipment for sensing and recording small, real-time changes in driver behavior—is helping the researchers’ determine how to predict and prevent collisions. “What if your vehicle could also talk to the road? What if your car knew that you were going from a two-lane roadway to a one-lane? Your vehicle could provide some sort of feedback to the driver, so that maybe you could change your behavior,” said Ph.D. student Justin Schorr before his captivated audience of high school students took turns piling into the instrumented car. The demonstration was part of Science, Technology and Engineering (STE) Day, which brought 130 students from 12 Loudoun County Public Schools to the VSTC. The ninth annual event included 11 hands-on workshops hosted by GW faculty and graduate students from departments across the university. Each introduced the high-achieving high schoolers to STEM career fields ranging from nursing and medical technology to digital forensic investigation and climatology. (From left) Justin Schorr, a research and teaching assistant in Professor Samer Hamdar's Traffic and Networks Research Laboratory, shows the instrumented vehicle that his lab designed to Brandon Itkin, a junior at Stone Bridge High School. 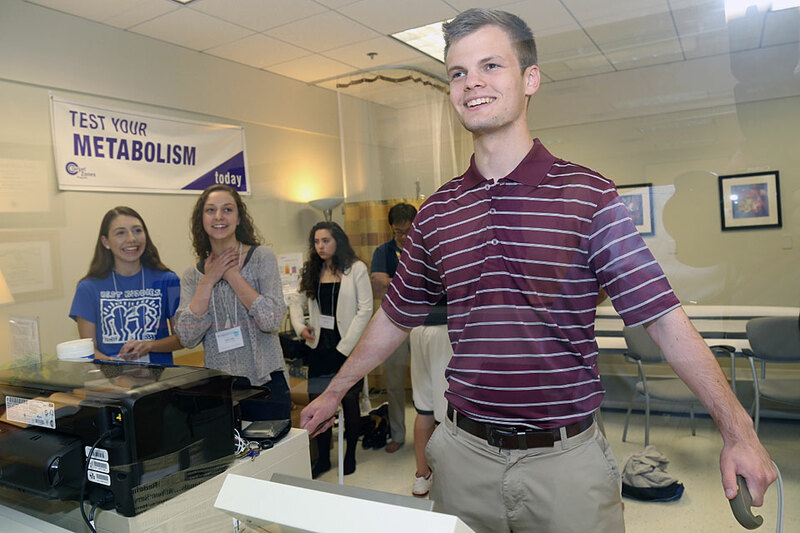 The Loudoun County students were among the first ever to make use of the Virginia Campus’ newly constructed teaching labs connected in the collections and conservation resource center (CCRC). The lab spaces will be used for chemistry, biology and physics courses and allow GW’s health sciences programs to expand. In the new wet labs, Professor Marcia Firmani and faculty from the School of Medicine and Health Sciences hosted a workshop about disease diagnosis in the clinical laboratory. 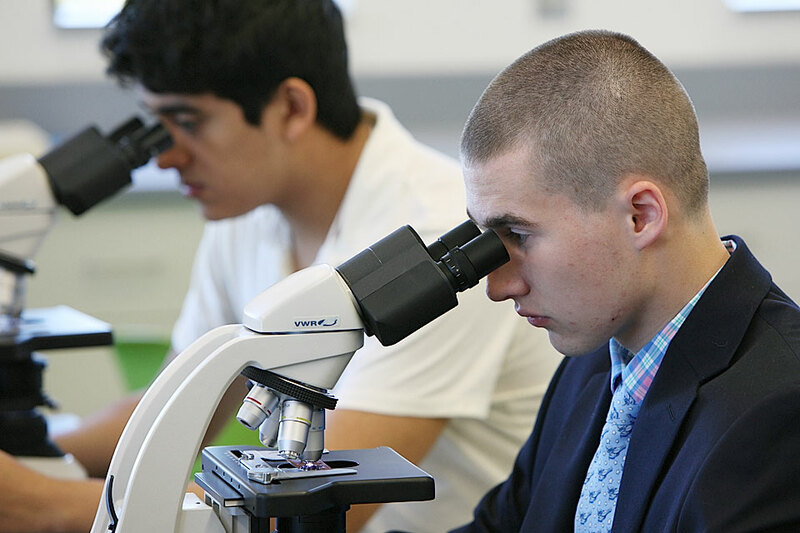 From parasites to urinary tract infections, students observed abnormalities under the microscope and learned how the trained eyes of medical technicians spot diseases. A few buildings away, GW School of Nursing students gave the high school students a tour through the Skills and Simulation Laboratory, which houses manikin patients and hospital equipment. At the school’s workshop that focused on maintaining healthy lifestyles, students touched a smoker’s lung, listened to a simulated patient’s heartbeat and attempted to do jumping jacks in 20-pound fat suit. After a midday lunch break, students listened to a keynote lecture from Diane M. Stanitski, a program manager in the National Oceanic and Atmospheric Administration (NOAA) Climate Program Office. Dr. Stanitski oversees long-term ocean observation projects that help scientists figure out how to best answer research questions on the Earth’s changing climate. During her presentation—which many students’ identified as one of their favorite parts of the day—Dr. Stanitski showed off the state-of-the-art instruments that are helping her and other climatologists understand and predict changes in the environment, like a sea ice mass balance buoy that helps to observe and attribute fluctuations in ice thickness. 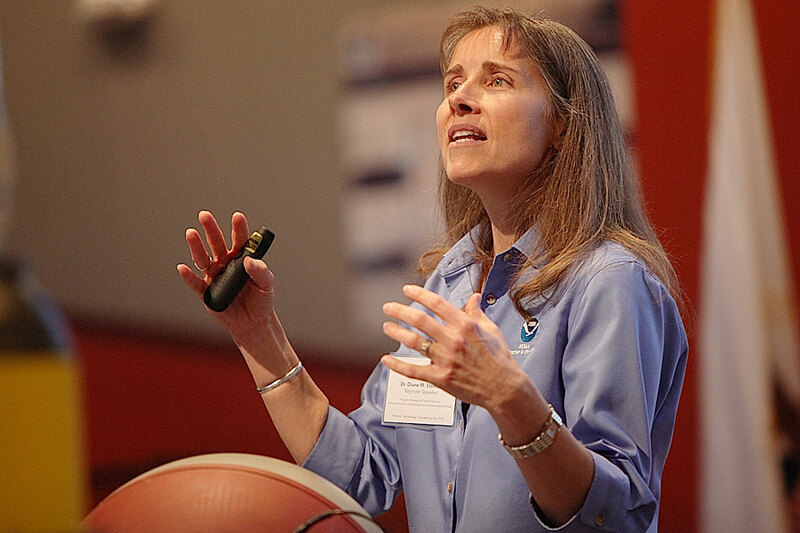 Diane M. Stanitski, a program manager at the National Oceanic and Atmospheric Administration (NOAA), speaks to Loudoun County students during her keynote speech. She showed students how she and other scientists are measuring the effects of climate change. She shared some alarming data with the high school students: Melting ice, changing tides and droughts caused by a heating planet all could have devastating effects on humans. Finally, Dr. Stanitski challenged the future scientists and engineers in the room. Uyen My Dao, a senior at Park View High School, said Dr. Stanitski inspired her. She was especially interested to learn that scientists can understand drought stress by observing the lines on tree bark. As she finished up her last workshop outdoors, Ms. Dao also was thankful for the sunny day, a pleasant turnaround from Monday’s chilly weather. 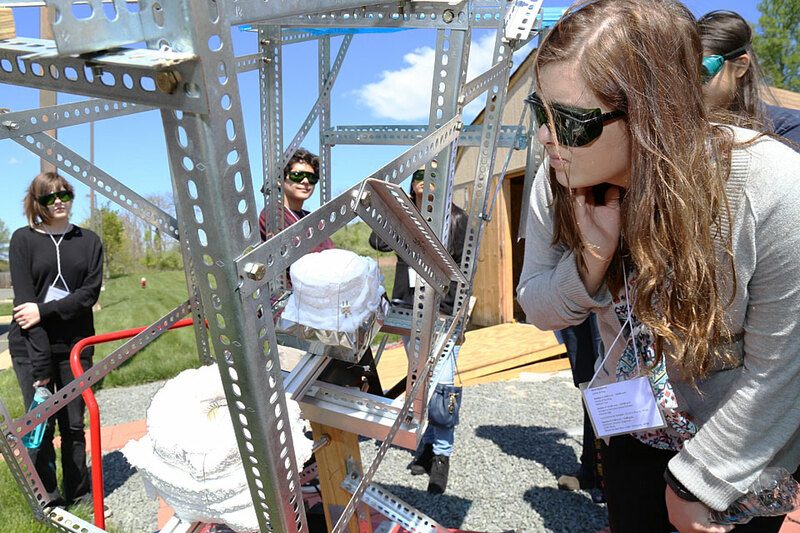 At the solar shed at the VSTC, Loudoun Country students explore how scientists from GW's Department of Chemistry remove CO2 from the atmosphere and convert it into fuels and metals. Megan Leftwich, an assistant professor in the Department of Mechanical and Aerospace Engineering, runs the "Flight of the Ping Pong Ball" workshop. 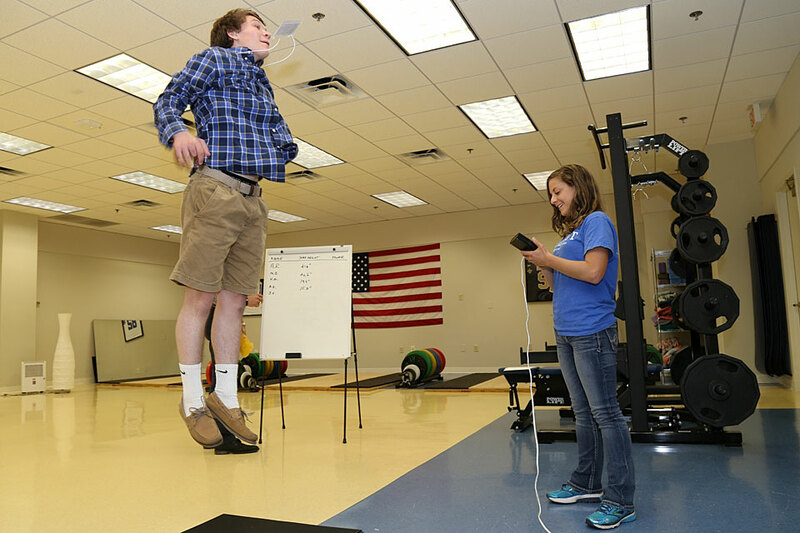 Faculty in the Department of Exercise Science measure a high school student's standing jump. Students measure their body fat percentage in a workshop hosted by the Department of Exercise Science. 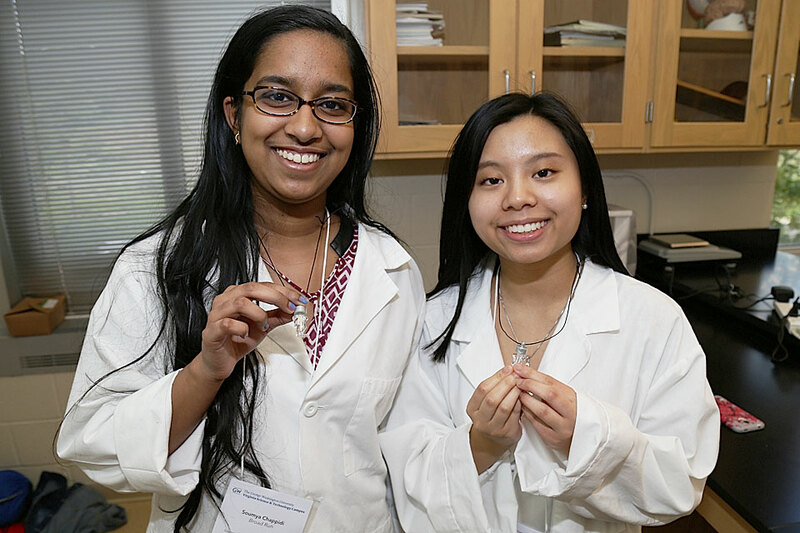 Soumya Chappidi and Tiffany Nguyen, Broad Run High School Students, show off vials filled with their own DNA. 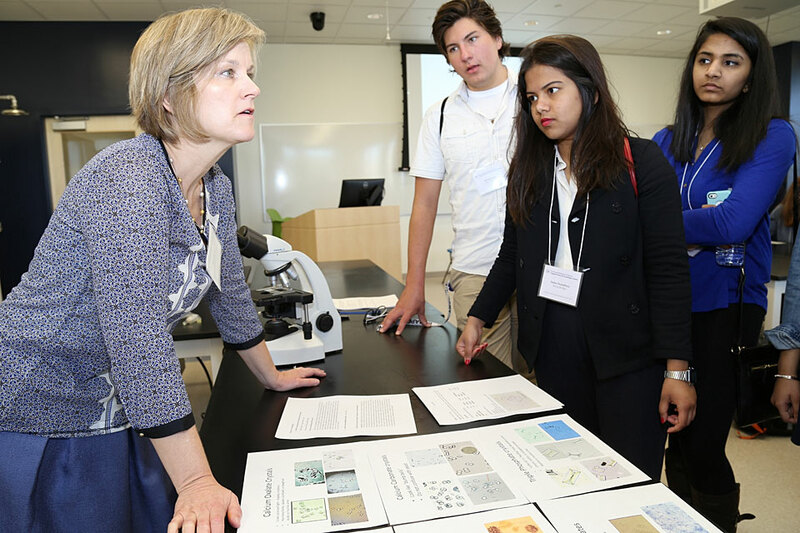 Students observe cells and parasites with microscopes at the VSTC's newly-constructed wet labs. Carol Rentas, a professor in the Department of Clinical Research and Leadership, explains to Sasha Chowdhury and others how medical technicians diagnose disease in blood and urine samples. 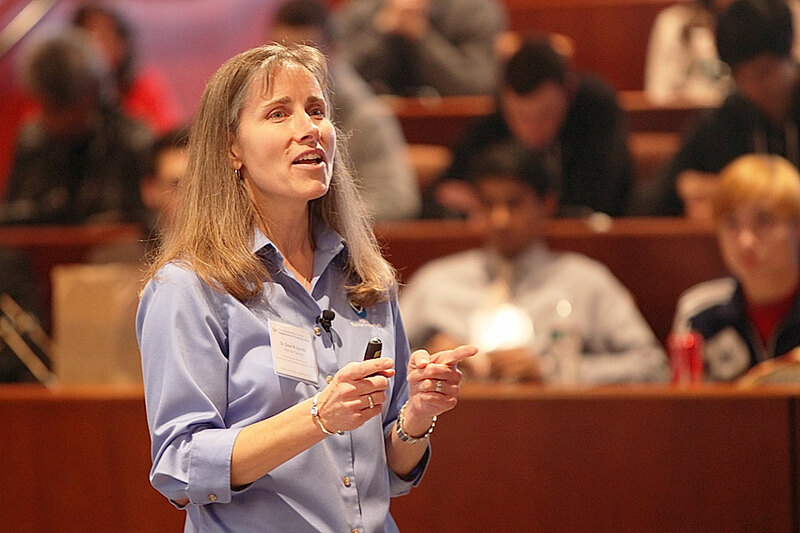 "Never say no to an opportunity," Diane M. Stanitski, a program manager at the National Oceanic and Atmospheric Administration (NOAA), said to students during her keynote speech.